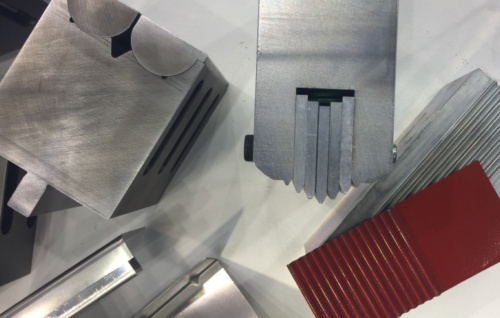 Normally every press brake tooling supplier has a lot of requests for special press brake tools with very few real orders. Why it is happen? In general customer can't imagine the price for special tool and makes improper calculation - like it will be something double as standard and that's it. So we will try to explain you better what are special tools for us and any other press brake tooling manufacturer. Let's imagine about standard punches. Everybody have them in stock and to give the best delivery normally punches are made in batch with production program like 100 pieces. Now, you need special punch. Maybe you need something other like standard but 10 years ago somebody bought this punch configuration and you just want repeat the same geometry because you know exactly how it works. And after receipt of the offer of 3000-4000 EUR for full length you are quite surprised because it is the third part of your press brake value. And there are a lot of situation like this with press brake of dead (bankrupt) companies, old non-grinded tools, special clamps, special angles etc. To have all cleared you need to see the question from the view of production. Any modification of punch outside of nearly standard parameters (for example small radius modification) requires completely new program to run. So basic main production will be cancelled for 1-2 pieces of special tools. So the main question of the special price is in general the tooling cycle i.e. special fabrication outside of main production program. This picture is the same for all producers, moreover we know the stories that even for expensive order the manufacturer doesn't want to stop production and to re-setup the machine for couple of days. And every customer should know that press brake tools is not just piece of metal even if it is in simple geometry but the piece of metal which should be fabricated under special program. Second story is the technical study. There is the true - nobody likes customers who will get the solution from one hands and after that will go to everybody looking for the best prices. Or with thoughts that solution is good but the price should be twice less and it is possible to find it from other suppliers. This is chances to all to understand budgets at the beginning. Unfortunately, as we told customer usually knows nothing and in such way it is really doubt that he will buy special tools from somewhere. Under our experience there is one more story with all special deformations. Usually press brake bending is connected with previous punching. Please be informed - if your punch press is not so old first step is to verify with all deformations - is the possibility to make them on punching press. For example we can offer tools for louvers to make with press brake but it will be double than punching tool. Same story with hinges. Same story with ribs and possible waveable deformation if it is 1-2 routes. So if you have punch press and the part could be done with it just even not try to study the press brake deformation because it will be waste of money and loss of time to study your project. But when the customer will be really customer for special press brake tools? When he needs the part, the part require special configuration tooling for the bending and he has real production quantity to make investments in tools. Because if customer has 10000 parts for standard tools, 10 for specials we never can sell special to him because there is no value to return money of investments. Next story usually are big forces press brakes and tandems, especially to make really deep parts with requirements of >300 mm height tools. Moreover sometimes tools are requested in long sections to remove any risk of loosing for tolerances - for example 6000+6000 mm could be more precision than 15... sections of 835 mm. But the story is completely other because the main value of equipment is very high - the machines for 12 meters could cost more than million of EUR. 10% of investments for tooling is really reasonable investment. And this is completely opposite story than replacement of tools for machine which is 30 years old and normal grinded tools could cost the same or higher.